Where are all the little creatures in our cities? There have been alarming declines of ladybirds, moths, bees, butterflies and beetles in our cities over the last 30 years – the urban eco-system barometer of how cities are responding to climate change. The little creatures are the inner beauty of invisible design who we need to multiply by optimizing the benefits of nature, and combining scientific theory with collaborative design. Approximately 80% of plants are angiosperms require pollination from either bees, butterflies or other pollinating insects; without these pollinators, most plant life would disappear in our urban mosaic of habitats. However, when we put people and eco-systems first, we design towards a new lifestyle as a living system. The Danish urbanist, Jan Gehl neatly summarises his approach as, ‘First life, then spaces, then buildings.’ In other words, as designers, our responsibility is for people and eco-systems before developing the places, and ultimately designing the buildings. By making conscious decisions to design the landscape with urban eco-systems as bio-filters, we can ultimately make a difference to atmospheric CO₂ trends. Currently, cities account for around 75% of the world’s carbon emissions energy consumption. To address these complex urban challenges to complement the more typical landscape approaches to climate change, we need to have the responsibility of keeping abreast of green energy and water research, implementing hybrid functionality and ultimately to work towards a more balanced supply. We need to explore more integrated approaches to challenge some of the conventional approaches to create solutions to reduce energy demands and increase renewable energy supply / re-use, to continue to inspire innovative ideas for new ways of thinking about the urban heat island, smart building orientation, re-use of water, efficient energy consumption and building façade / roof treatments. Intelligent massing at the earliest stages of urban planning and includes harnessing local opportunities and building orientation as part of an integrated microclimatic response. For buildings, we are seeing integrated green roofs and water storage created for aquaculture through tilapia tanks to create high yield food production within buildings. The technology had been around for decades – it’s the collaborative mindsets between disciplines that need to come together. Benefitting from solar energy for passive heating in winter, prevailing winds as a cooling mechanism, and creating shelter and shade from unwanted solar gain and glare and shelter from cold winter winds and local air pollution in the public realm. Whilst planting creates shelter from sun during hot months, this needs to be balanced with admitting daylight and low angle solar energy for passive heating in winter. Morphis and architect WilkinsonEyre have won a major international competition for a 6.3ha urban design and masterplan project in the Greater Bay area of Shenzhen, southeastern China. 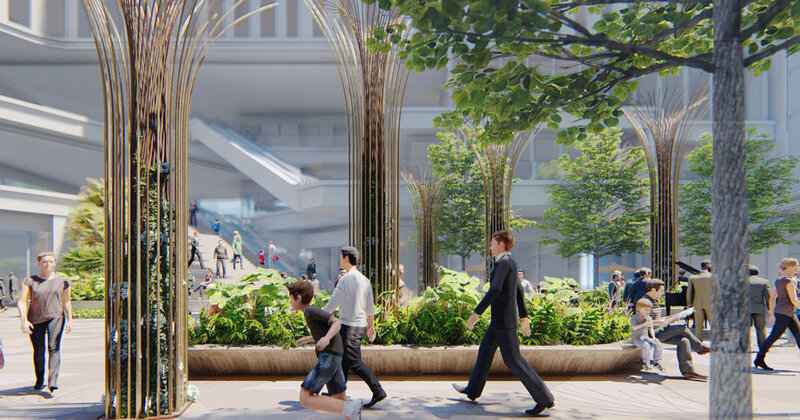 Commissioned by the Shenzhen Government, the Shenzhen Bay Avenue East Extension will create a 1km multi-layered pedestrian connection, shaping the future of the city’s urban fabric to form a vibrant and culturally-animated transition between the commercial district of the city and the bay. The result will be a new city destination of lively public realm promoting healthy and sustainable living. The winning design celebrates the concept of ‘City-Culture-Bay’ to create a coherent ensemble of interconnected elevated walkways, linked by escalators and stairs to a lively streetscape and basement level civic realm. The route passes through three distinct zones, from the central business district through to a new cultural quarter and on to a landscaped park on the bay. The design will become an ensemble of animated places, as a series of destinations along its linear route, framed with new commercial and cultural buildings. Key urban spaces include a transport interchange with a bus station and links to two subway stations, a sunken plaza and the Platform Park, envisaged as a calm space amid the hustle and bustle of the city. Retail has been incorporated within two extensive basement levels along the Avenue where the multi-layered landscape brings light and shade into to create dramatic internal spaces, connected through vertical circulation nodes to form part of the integrated wayfinding strategy. The competition was organised by one of China's leading developers, CR Land. The other shortlisted practices were Sasaki Associates, Turenscape, MLA+ and UPDIS, BNP and ShenDu, and Aecom. 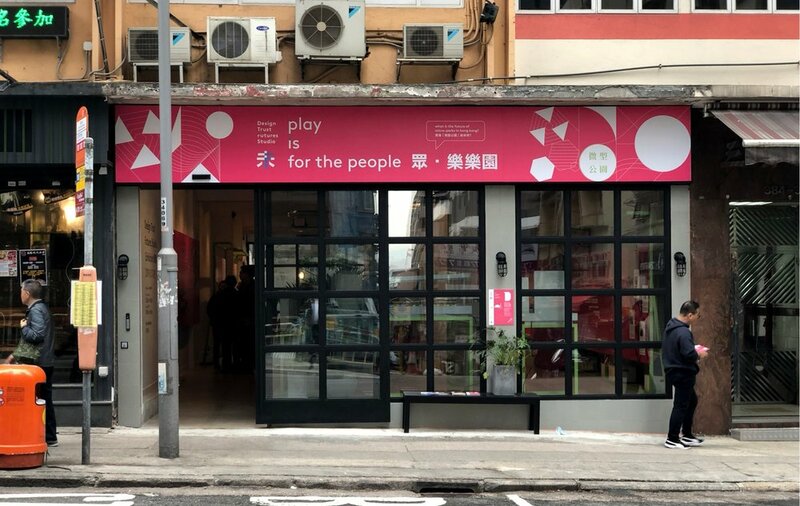 Join us at the Design Trust ‘Play is for the People’ exhibition and design dialogue this afternoon 4-6pm in Hong Kong with Morphis’s Mark Blackwell, one of the co-moderators for the discussion on the evolution of micro-park design, along with Marisa Yiu (Co-founder/ Executive Director, Design Trust) and Christopher Law (Founding Director, The Oval Partnership Ltd). The exhibition reflects on the creative processes and collective design of the flagship programme Design Trust Futures Studio. Working closely with the local communities and other stakeholders from both private and public sectors, the design teams translated their findings from site research and analysis, as well as various public engagement sessions into four unique concepts for micro-park concept designs located in Hong Kong. On site in the heart of Fuzhou, China at the incredible Shangri-La development where we are creating a unique urban sanctuary landscape with David Buffonge from Lead8, Beng Chee Lim, CEO of Shangri-La Hotels and Morphis's Mark Blackwell. An expansion of the existing 5-star Shangri-La Hotel which was built in 2005, the development includes 50,000 sqm retail podium, cinema, food courts, plaza spaces, outdoor and alfresco dining areas, and a direct connection to a new subway station, as well as the hotel and a 100m tall Grade A office tower. Morphis’s design approach celebrates the experiential journey of guests, visitors and the local community to connect with local character, culture and history to enrich urban life in Fuzhou. The development is anticipated to be completed by 2022. We’re delighted to be appointed as the landscape architect for the Heart of Wuhan development - the city’s most significant urban renewal initiative. Drawing inspiration from the local city culture and adjacent buddhist Guiyuan temple, a treasure since the Qing Dynasty, our design response incorporates a respectful and delicate social approach balanced with contemporary design. We are delighted to be collaborating with SLIM and architects Lead8 on the new Fuzhou Shangri-La mixed-Use development, in the heart of Fuzhou city. An expansion of the existing 5-star Shangri-La Hotel which was built in 2005, the development includes 50,000 sqm retail podium, cinema, food courts, plaza spaces, outdoor and alfresco dining areas, and a direct connection to a new subway station, as well as the hotel and a 100m tall Grade A office tower. We’re delighted to be shortlisted with our partners Wilkinson Eyre architects as part of the international design competition for the strategically positioned Shenzhen Bay Street. With the rapid pace of growth and the challenge of climate change, Shenzhen Bay Street is undergoing an exciting and dynamic evolution. The importance of public spaces for enhancing quality of life in Shenzhen is rightly at the top of the local design agenda - beautiful and well-connected parks, plazas and streetscapes enhance everyone’s quality of life and are symbolic of a thriving, well-served and successful city. The creation of new and contemporary public realm integrated with city life is crucial to shaping the future of Shenzhen Bay’s urban fabric for all those who live, work and play. A preview of our design progress for the new waterfront park in Beijing, part of the wider 86 acre public open space Morphis are developing, celebrating lifestyle as a living system through connections with nature, to explore and discover beyond boundaries. The completed 175,000m2 phase one development includes a 68,000m2 Retail and Entertainment Podium, the 369-key EAST Hotel and ONE INDIGO, a 58,000m2 international Grade A Office Tower. A wonderful evening at the Four Season’s Hotel in Hong Kong with Steve Leung celebrating SLD’s recent listing on the Hong Kong Stock Exchange, along with leaders and shapers of our industry. As a true collaborator on a number of Morphis projects, a big thank you to the talented SLD team where art, nature and people come together to share a journey. Behind the scenes with Morphis Director, Mark Blackwell, shooting the interactive marketing video for our Tong Zhou, Beijing mixed use development at the famous Shaw Studios in Hong Kong. The marketing suite will be open in September 2018 and the main development in 2019. 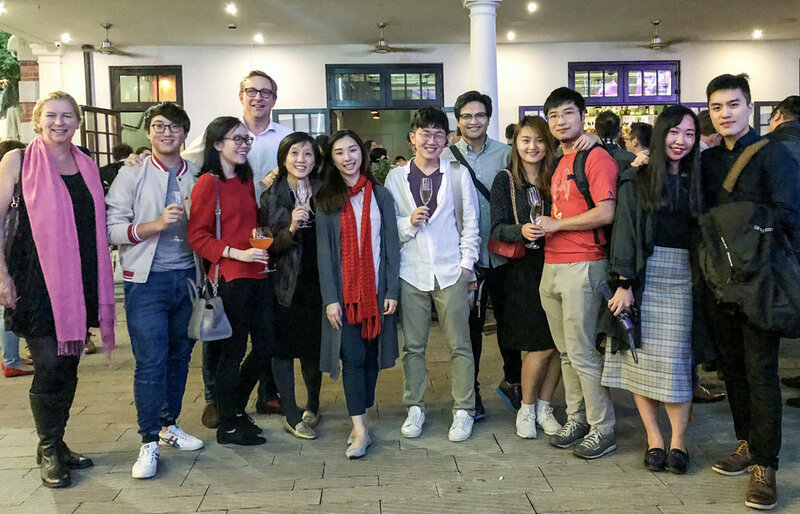 Mark Blackwell, Director, has been appointed as a design advisor for Design Trust Hong Kong, creating platforms to support and stimulate design through creative sharing and engaging communities. As an extension of last year’s inaugural Design Trust Futures Studio, the 2018 theme for Futures Studio is “PLAY IS FOR THE PEOPLE”. Tackling and promoting the ideas of innovation, leisure and play, which creates meaning from the people, for the people with human factors, ergonomics and physical designs in play. Four practical yet playful micro-parks will be realized in four different locations around Hong Kong. Morphis were appointed to develop the landscape to one of the world’s tallest office buildings in China to create an iconic presence and centerpiece to the burgeoning central business district, in the Futian District, Shenzhen. The podium includes five floors of retail shops that terrace away from the tower to form a large amphitheater-like space. The building is also defined by a central atrium, which serves as a public vestibule and allows daylight in, creating a welcoming space for meeting, shopping and dining. Ping An is the fourth tallest building in the world (falling behind Dubai's 828m Burj Khalifa, the 632m Shanghai Tower and the 601m Makkah Royal Clock Tower in Mecca), and accommodates 100 floors of offices for 15,500 employees, as well as an observation deck – which is expected to receive 9,000 visitors daily. A sneak peek at the new Morphis book and presentation box celebrating our work to date, creating experiential destinations across Asia, the Middle East and Europe for public realm, commercial, retail luxury residential and hospitality developments. Let us know if you would like a copy . . .
Morphis win Hainan memorial park! Morphis is delighted to be appointed as the landscape architect for the new Hainan Memorial Park to create an experiential landscape around the concept of healing and remembrance. A landscape that stands as a symbol of peace, to enhance the feeling of contemplation and remembrance, as well as a destination for visitors to interact with its natural mountainous and sub-tropical context. The landscape embodies Hainan’s DNA, emotionally, visually and ecologically, as an ever-changing landscape experience for all seasons. The sculptural quality of the park will draw visitors to the expansive energy that radiates outward into the landscape. A series of living sensoriums, a place full of fun and discovery, a place for special events. Symbolic of the native jungle, weaving a sinuous network of connections through the park and beyond, growing coherently and continuously in time and space. Morphis’s Creative Director, Mark Blackwell was a panelist in a stimulating discussion at the Urban Land Institute event on ‘Shaping Hong Kong's New Central Harbourfront’ on Wednesday 20th September 2017 at The Hong Kong Maritime Museum – an extraordinary opportunity to simultaneously transform and unite Hong Kong to create a truly world-class waterfront. This highly anticipated event will explore the challenges and opportunities of Site 3 of the new Central Harbourfront (from Jardine House to the Central Ferry Piers) which will shape the future use and enjoyment of Hong Kong's iconic waterfront. The panel discussions focussed on three key topics: Context, Disposal and Design. The infrastructure is in place, it’s now time to deliver a true setting to a world class skyline! Morphis are experienced landscape architects working with a number of leading international clients creating transformation. We now need to grow further and expand our own brand reach to build on this success. We established Morphis in mid-2014 in Hong Kong and expanded into Shanghai a year later. The team have developed rich project experience and have collaborated on developments around the globe in Asia, Europe and the Middle East. We have won a number of leading international design competitions along the way. The time has now arrived to expand with a physical presence in the UK to better serve clients in Europe and the Middle East and secondly to expand our passionate and creative team to service a growing number of international projects. We are a consultancy of creative thinkers, innovators and designers, collaborating on projects around the world. We reflect this rich mix of cultural connections with our young and cosmopolitan, yet experienced team exploring the intersection of city, society and nature. We create memorable destinations and healthy places to live and celebrate life. From December our studios in Hong Kong and the UK will be able to combine landscape strategies and experiential design to create truly memorable destinations wherever they are in the world. We have a boutique appeal with a global reach - creativity without boundaries.